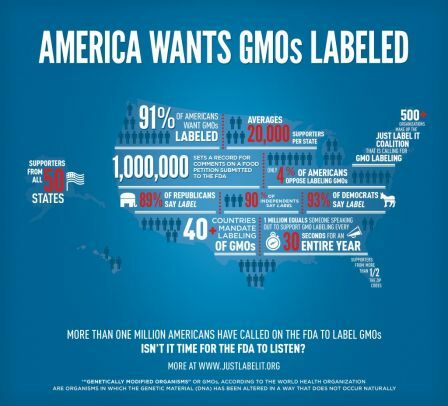 Last week Just Label It announced they had hit a million comments with their online petition to the FDA demanding the need for GMO (Genetically Modified Organisms) labeling. And how did the FDA respond? By saying there was actually only 394 comments. Those million plus collective signatures, more than any other petition submitted to the FDA in its history, that were collected in less than 180 days by Just Label It's more than 500 organizations, will only be counted as 394 because of an FDA rule that states that if thousand and thousands of people sign a single petition or submit the same form letter they are only counted as one collective signature. Now in the world of GMOs and GE (Genetically Engineered) food the player who has the most to lose by a label mandate is Monsanto, the agricultural multinational at the forefront of the GMO world. And who is the senior adviser for the FDA? So it's no wonder that one million equals 394. Natural Product Expo West was held a couple of weeks ago and truthfully I am just recovering the craziness of it all. More than 60,000 industry members and over 2,000 exhibiting companies filled more than 1 million net square feet at the Anaheim Convention Center on March 8 – 11, 2012. Totally Whole Foods in Vegas on Crack! The Expo can be many different things to many different people, but for me it’s about seeing where the world of healthy eating is going, learning more, and trying more. Last year the watchword of the Expo was Gluten Free, this year it all boiled down to two phrases I heard over and over again: non-GMO and Vegan. The rally to finally get America to start labeling GMOs on the state and national level is picking up speed (by the way in case you were wondering countries that require labels or have outright banned GMOs include: Brazil, Germany, UK, Spain, France, Italy, Poland, Russia, Saudi Arabia, Japan, Australia, South Korean, and China). Also the concept of Veganism has definitely come to the forefront (by the way in case you were wondering (again) some famous people who are members of the Vegan Club include: Bill Clinton, Ellen Degeneres, James Cromwell, Steve Wynn, Casey Affleck, Travis Barker, Russell Simmons, Mike Tyson, and Ozzy Osbourne). them out if you get a chance! In the world of Vegan eating there sometimes are unexpected gaps in your food choices. Everyone knows there’s no meat or dairy, but how many people realize that marshmallows are also blacklisted? But food conscious S’Mores lovers rejoice! Dandies Vegan Marshmallows are 100% Vegan, Certified Kosher, and Gluten Free. Made on dedicated Vegan equipment with zero Gelatin these little sugar pillow even catch fire like traditional marshmallows. I have to say I am tragically undereducated when it comes to Afghani food (which I thoroughly admit is ridiculous considering how much our countries have intertwined in the past decade). So I was totally floored when I discovered East & West Gourmet Afghan Food Inc and that their vegetarian product Bolani was one of my favorite foods at the Expo! Bolani is a traditional Afghani flatbread stuffed and baked with either spinach, pumpkin, red potato, or green lentil filling. It is usually served warm and as a side dish, appetizer, hors d'œuvre, or even as a main dish. Initially found in only a few of the Bay Area’s farmers’ markets, this unique fusion of East and West now participates in over a 100 farmers’ markets every week and can be found at Whole Foods. In the world of meat subs (meat subsitutions) 71% of the meat sub dollars go to MorningStar. And yes they make kickass Buffalo Wings, but this year I made sure to spend time focusing on the all the other companies out there. Now I have mixed feeling about meat substitutions (in reality they’re chocked full of chemicals) but sometimes you just want a chicken nugget or in Vegetarian Plus’ case a Whole Turkey. No joke! They actually make a 100% non-GMO Soy Based (not my favorite, but in small amounts totally okay) Turkey with Vegan Gravy and Stuffing. It was crazy, their “bird” was firm, moist, and totally tasty. Another benefit: their turkey heats and serves in just an hour. Score and score again! Every year I learn something at the Expo that totally blows my mind. This year it was that most wine these days isn’t considered Vegan (this is because of a process called Isinglass, where wine is filtered or clarified with non-Vegan things such as: Egg whites, Fish bladder, Milk Protein, and Gelatin). But for those who want to enjoy the nectar of the Gods, Girasole makes a totally Vegan wine. Girasole (which is Italian for sunflower) vineyard’s have been certified organic by the California Certified Organic Farmers for the past 20 years (the founder of Girasole notes that he’s “been farming organically for 50 years; the first 30 I didn’t know it. There was no organic certification process. Prior to World War II, growing without commercial chemicals and fertilizers was standard procedure."). My favorite bottle of theirs is their Hybrid Red: a great combination of 65% Cabernet Sauvignon/ 25% Syrah/10% Merlot and Gold Medal 2011 San Francisco Chronicle Wine Tasting. With the flavors of black plum, coco power, and violet in a medium tannic environment, the Vegan/Organic certification and the under $20 price point make it both ethical and economical. I met Rob Behnke Bowman, founder of Brooklyn Salsa, rocking it out to the band Holy Ghost! at his booth at the Expo (which is totally not the norm at this trade show). A businessman and musician (Rob plays under the title The Blue and Red 3D Spectacular), he and a friend started Brooklyn Salsa when they made their first batch of salsa for a party they were hosting. 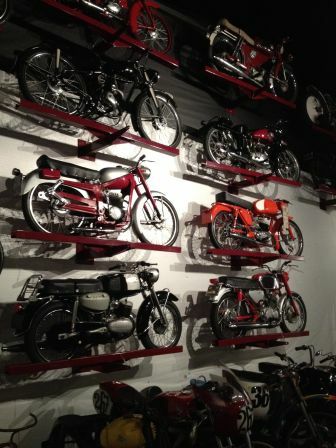 A few years later the company has become a Brooklyn institution. Made with primarily organic ingredients from small, New York based farms, they use no artificial preservatives only fresh Lime Juice (the tomatoes are harvested and then frozen until they needed to be used). 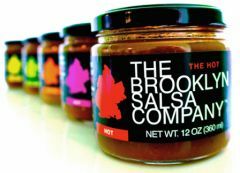 Their salsa blends represent each of New York City's six boroughs. My Absolute Fav? The Bronx, an Indian-inspired salsa with eggplant and curry powder. It totally rocks! Another thing I learned that isn’t normally Vegan: condoms! That is until Sir Richard's Condom Company entered the scene last year. Their belief is simple: that condoms, like food, should be chemical free. With that mission statement their casein-free 100% natural latex condoms are vegan certified by the American Vegetarian Association and free of parabens and spermicides. Like a lot of great companies these days they have a one for one commitment, so for every Sir Richard’s Condom purchased they donate one to a developing country. Found at Whole Foods across the company they’re definitely a fun find! Yes they’ve been around since 2004, but Coconut Bliss is worth mentioning just because of the number of visitors they were getting at their booth at the Expo. 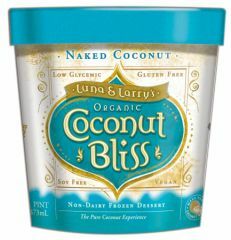 Their “ice cream” is Dairy, Soy, and Gluten free, uses only USDA certified organic ingredients, and has received certification from the non-GMO Project. At the Expo I was "talked into" trying their Naked flavor, which is exactly what you think it would be: plain coconut. Now as someone who has a tendency to go for the bells and whistles of flavored ice cream, I was blown away by the simplicity of it. Creamy, creamy, creamy goodness. Turns out plain coconut, is anything but boring. Wanted to be educated on GMO Labeling with a catchy little ditty (by Mr. Rob Herring)? Check this out! If it drives you nuts (and if you're a registered California resident) let me know. I'm collecting signatures for the California Right To Know Genetically Engineered Food Labeling Ballot Initiative! For those know aren't totally in the know about Hemp, its benefits, and the fact that it's not legal in this country even though it's totally renewable. All to a new-agey yoga song by the The Luminaries created by Elevate Solution Series. 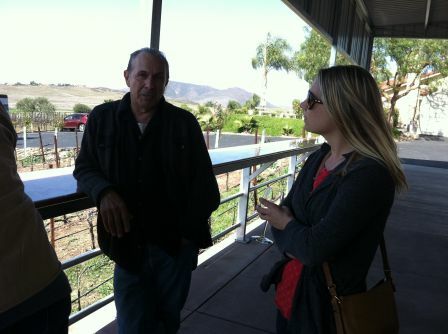 A couple of weeks ago I drove down with the family to explore the world of wine country, Temecula style. Now I’ve done your classic California wine tasting in the forms of Sonoma and Santa Barbara (many, many times), but I’ve never done one of Los Angeles’ closest wine trip getaways (truthfully snobbery might have had a tad to do with it). But past bias aside, with over 30 wineries that encompass over 35,000 acres of rolling hills and vineyards, “rural” Temecula has definitely joined the game. And the jewel of these wineries (whose product definitely rivals those of more “established” wine countries) is Doffo Winery. Nestled on the Northeast border of the Temecula Valley, Doffo Winery is the epitome of Craft (one of my favorite words when it comes to food and wine!). 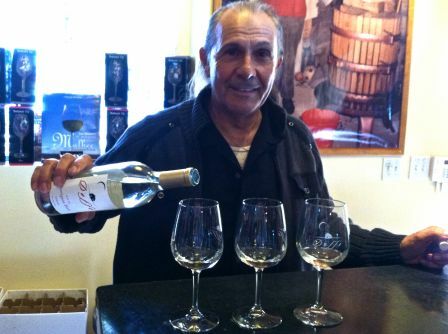 Founded in 1997 by Argentinian Marcelo Doffo, it is one of the only micro-boutique wineries in the Temecula region. Situated on 15 acres of lush vineyard the winery’s focus is on producing small lot, hand crafted wines that represent some of the best varietals grown in the Temecula Valley. The wines of Doffo are definitely of the old world variety (Marcelo’s family emigrated from Italy to Argentina a couple of generations ago). They are both sweaty and romantic, earthy and dreamy. Marcelo’s wines are mostly definitely not something you’d pick up at Costco (you can only get them through Doffo’s wine club or the occasional pour for library wine events). Doffo’s philosophy is that good winemaking begins in the vineyard, so to ensure “happy grapes” they employ a multitude of techniques from using a computer regulated watering system to playing classical music to the grapes. 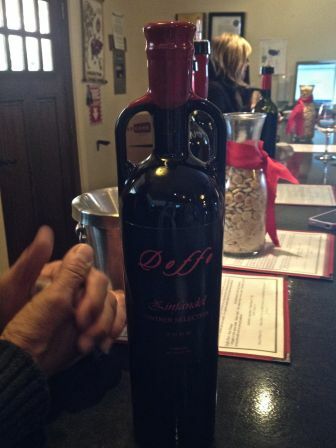 The highlight of the tasting was the Zinfandel Reserve '09; this bottle exemplifies Craft! Everything about the wine is 100% Handmade, from the double handle glass bottle to the super long cork sealed dramatically in red wax to the mind blowing taste. Romantically robust and bold, the wine swirls with notes of blackberries, toasted oak, and vanilla. The bottle sells out everything else they have (which is saying something when its going retail price is $150). In the course of a week and half, I’ve now twice encountered Jeff Mahin, Chef/Partner of Stella Rossa Pizza Bar. First at Zagat’s first-ever LA 30 Under 30 list, honoring the top chefs, managers, mixologist and industry professionals under the age of 30 in the LA/So. Cal area, where he was honored as one of the elite 30. Jeff’s awesomely unassuming for a super young Chef/Partner (he’s 28). The second time was on Tuesday at the Windy City West 2012 event held at his restaurant (again, Stella Rossa, for those just skimming this post) along with their sister restaurant M Street Kitchen. For those who don’t know Windy City West it’s a legendary party uniting Chicagoans in entertainment in Los Angeles (total disclaimer in preparation for a couple of paragraphs down: I am Jersey born and breed). For someone so young, Jeff’s got quite the culinary background. At the age of 17, he dropped out of school to cook at Nobu in New York. Then, without ever having been to the restaurant, he was hired to work in the culinary laboratory at the Fat Duck run by Heston Blumenthal the famed molecular gastronomist. 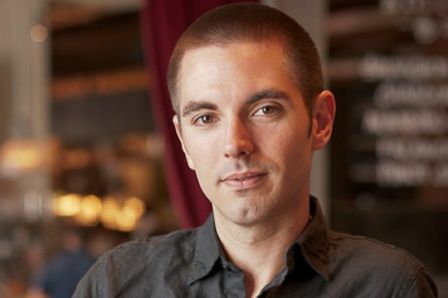 By his early 20s, Jeff was back in the U.S., hired by Chicagoan Rich Melman, founder of the restaurant company Lettuce Entertain You Enterprises, as his chef in charge of developing new concepts. So when Melman decided to open his Stella Rossa Pizza Bar in Santa Monica, he called on Jeff to create the pies, which have become to be known as one of the staples of the insurgent pizza revival in Los Angeles. I like to think of Stella Rossa as all the tastiness of Pizzeria Mozza, without all the pretentiousness. Now I’m sure I’m not supposed to say this because on this given night we were celebrating all things Chicago, but even though all the Chicagoans were going gaga for the deep dish Lou Malnati’s pizza slathered in cheese (which is a Chicago staple), in my opinion Jeff’s Stella Rossa pizza was the winner of the night (and remember, I did give you a disclaimer in the first paragraph). Substantially thick, but still holding that great crispy crunch it was the shining star of the event. And I’m not alone in my admiration; Stella Rossa consistently has a wait at its doors! Seafood is the highest traded commodity on the globe. By the year 2048 the UN predicts that we’ll be commercially fished out. No matter who you are or where you’re from, you have the right to know what’s in your food, especially when it comes to GMOs. (Genetically Modified Organisms). Currently, food companies are not required to label foods that contain GMOs even though 80% of foods in U.S. grocery stores are made with GMO ingredients. GMOS are labeled in other countries, just not in the US of A. And why should you care if nasty GMOs are in your food? • GMOs are in 75% of processed food in grocery stores. You eat them everyday. • GMOs can create serious allergic reactions. • GMOs require heavy use of toxic herbicides. • GMO corn makes its own pesticides within the plant – remains in your food. • GMO cross pollinate… organic crops are being contaminated. Label GMOs has until April 22nd to get 800,000 signatures to get this on the 2012 California Ballot. Because this is a California Ballot Initiative, in-person, physical signatures are required (signatures can’t be gathered online). So if you see some looking for your John Handcock sign with the passion of knowing you’re helping create accountability in our food system (and have us catch up with the rest of the world).